This is so yummy and so perfect for a summertime get together. I will tell you it takes a lot more time to prepare than I had originally anticipated. I thought I would be able to throw it together in less than 15 minutes, but the peeling, coring, and dicing of the fruit is a little time consuming – so be prepared! Take this to your next bbq! The guest will love it! 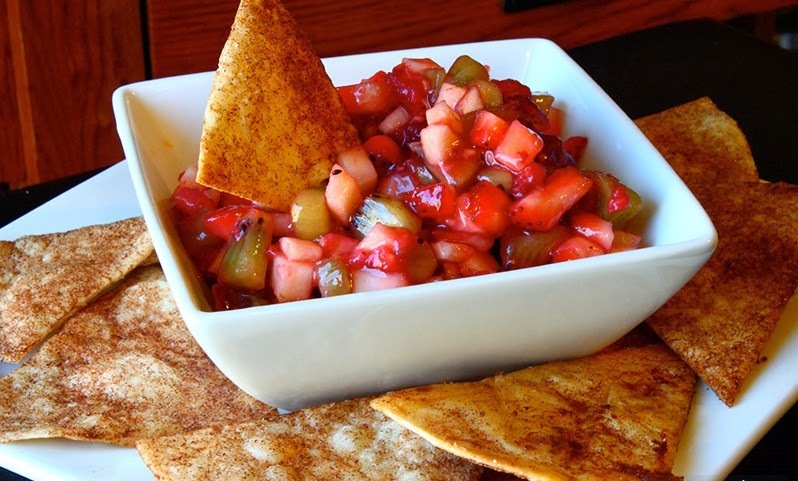 In a large bowl, thoroughly mix kiwis, apples, raspberries, strawberries, white sugar, brown sugar and fruit preserves. Cover and chill in the refrigerator at least 15 minutes. Preheat oven to 350 degrees. Coat one side of each flour tortilla with melted butter or butter flavored cooking spray. Sprinkle tortillas with desired amount of cinnamon sugar. Cut into wedges and arrange in a single layer on a large baking sheet. Spray again with cooking spray (not necessary if using melted butter). Bake in the preheated oven 8 to 10 minutes. Repeat with any remaining tortilla wedges. Allow to cool approximately 15 minutes. Serve with chilled fruit mixture. Best when made and eaten the same day otherwise the fruit gives off so too much juice and it gets runny.